Taco Bell opened its doors in Shibuya, Tokyo. TOKYO — After a high profile re-entry to Japan, Taco Bell, a subsidiary of Yum Brands, has been prompted to suspend and review its website as a result of criticism on social media over roughly translated Japanese. Users of Twitter drew attention to sections of the company’s website, which featured menu items such as "cheesy chips" rendered as "yasuppoi" chips, inadvertantly suggesting the product looks cheap or poor quality. In further tweets, Tomoyuki Akiyama, a multilingual communications professional based in Tokyo, noted the "Crunchwrap Supreme–beef" had been translated as "Supreme Court Beef," and that the phrase "We’ve got nothing to hide" had become "What did we bring here to hide it?" Akiyama also highlighted what he termed "a surreal, gibberish history" of the company’s establishment in California, and pointed out that the bulk of Taco Bell Japan’s tweets were in English, suggesting US expats were the brand’s primary target. "The way Taco Bell Japan communicated online made us feel Japanese locals are unimportant to them," Akiyama told Campaign Asia-Pacific. "The default language of the website was English, and there was a small Japanese flag at the top." Akiyama suggested Taco Bell had used Google Translate, which is notoriously unreliable for complete sentences. Another commentator on Twitter, @kazamatsuri, said the brand needed to up its game if it was going to "make a go of it" in Japan. C'mon, @TacoBellJP, if you're really going to try to make a go of it, at least use something better than Google Translate for your site. "I have nothing against Taco Bell," Akiyama added. "I lived in the US and I like their food, but the way they de-prioritized our language is sad." Taco Bell has responded quickly to the criticism. A spokesperson, Shivram Vaideeswaran, contacted Campaign after a request for comment via Taco Bell's Japanese Facebook account. He confirmed that the company had suspended its website and was revising the content. He denied that it had used Google Translate, but admitted that it had used translation software and worked with its franchisee for the development of local-language content. Taco Bell signed a franchise agreement in February with Asrapport Dining, a domestic company. Vaideeswaran said Taco Bell was keen to raise the quality of its communications in the market. "We’re always looking to improve our website," Vaideeswaran said. "It’s always a moving process. As we start receiving more feedback from people in Japan, we want to make sure we’re answering them and using that feedback." With regard to Taco Bell’s Twitter presence, Vaideeswaran said the company’s strategy was to feature "a mix of both English and Japanese" and that as the company moved forward it would use more Japanese. He said Taco Bell was in the process of building its marketing team for Japan and denied that the restaurant was concentrating on the expat market. "We want to target everyone," he said. "Expats are not a big enough strand for us in order to be successful. We are looking at the entire audience." 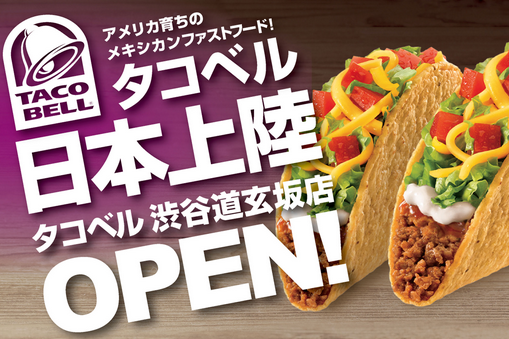 The response to Taco Bell’s re-entry to Japan has been largely positive. Its opening earlier this week in Tokyo’s Shibuya district drew crowds well before the doors opened at 10 a.m., with some customers reportedly camping outside the restaurant overnight. "’It’s been a great couple of days," Vaideeswaran said, noting that there had also been positive commentary on social media. Taco Bell first entered Japan back in 1988, but pulled out after finding limited appetite for Mexican food at the time. In an interview with Campaign last month about Taco Bell’s prospects in Japan, Barry Lustig, partner of Cormorant Group, a US-based consultancy with experience in Japan, said he was optimistic for the brand, especially as more generic US fast food outlets are struggling. McDonald’s’ business, for example, is shrinking in the market: The company plans to close a large number of outlets in response to falling sales. "There will be a lot of naysayers about Taco Bell making a move into the Japanese market," Lustig said prior to the restaurant's opening. "[But] the decline of Western food brands in Japan presents Taco Bell with an opportunity to differentiate and succeed there." Other US brands looking to open in Japan in the near future include Shake Shack and Carl's Jr. In the interview, Lustig said it was important for Taco Bell not to fall into the trap of being "strategically lazy" like many other Western food brands that rely "on overly restrictive global brand templates that don’t resonate with their Japanese consumers." Clearly, Taco Bell is still in a relatively strong position with much to gain, but has also had a taste of what awaits it if it fails to localize adequately. "Top Chef" Michael Voltaggio makes a mess for Carl's Jr.